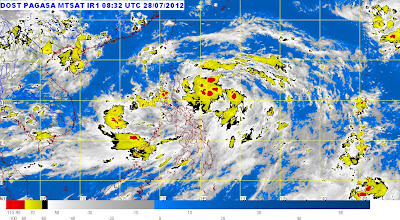 Bagyong Gener intensified rapidly into a tropical storm while moving in a north northwest direction, the PAGASA reported Saturday, July 28, 2012. Bagyong Gener was estimated based on satellite and surface data at 250 km northeast of Virac, Catanduanes (15.4°N, 126.3°E) at 4p.m, the PAGASA said. Due to the weather disturbance, the bureau has hoisted storm warning Signal No. 1 over the following areas: Isabela, Cagayan, Calayan Group of Islands, Babuyan Group of Islands and Batanes Group of Islands. Bagyong Gener is packing maximum sustained winds of 65 kph near the center and gustiness of up to 80 kph. It is expected to be 290 km northeast of Casiguran, Aurora by Sunday afternoon and 130 km northeast of Basso, Batanes by Monday afternoon. The PAGASA added that the tropical storm will yield an estimated rainfall amount of 10 - 25 mm per hour (heavy - intense) within its 500 km diameter. The tropical cyclone is expected to enhance the Southwest Monsoon that will bring rains over Southern Luzon, Visayas and Mindanao especially the western section. Fishing boats and other small seacrafts are advised not to venture out into the Seaboards of Central and Southern Luzon, Visayas and eastern seaboard of Mindanao due to the combined effect of Tropical Storm Gener and the Southwest Monsoon.